Was I Winning or Loosing Today? Today I definitely did not feel I was winning. I woke up and wasn’t feeling it, I knew about a dozen people wanted to go to the same area, the question do I go, don’t I was running in my head. One of the routes we were talking about requires ropes and I couldn’t be bothered with any rope faff either with more than one other person so that made my choice of line easy, the South side of Tour Ronde from the summit. All was going well on the approach and we soon left the crowds behind but then the day started to go pair shaped for me. While I was at the bergshrund putting my crampons on, one of my skis that I had placed tail down into the snow suddenly slipped through the pow and took off down the glacier. I’m stilling getting used to rockered tails and should have embedded it deeper. We watched in vane hoping it might flip over but a 130-140 wide ski is pretty stable and it disappeared out of site leaving a trail in the pow. I said cheerio to De Masi and Miss Daily and headed off down the glacier on one skis thinking I’d be going back to helbronner to download minus a ski and binding. About a km down there was a 50 m wide crevasse with a snowbridge 30 m down and on it nothing else but my lost ski. A quick abseil off my other ski and I was back in the game with 2 skis! I just had to catch up with Davide and Liz who were climbing up the normal route on Tour Ronde and after an hour of hard work I joined them on the summit. 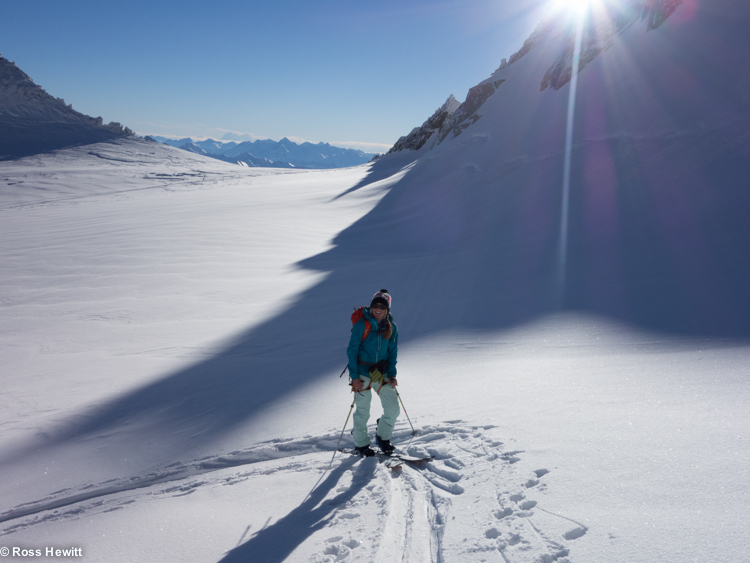 The start of the South West couloir was full of sharks and after moving about 50 cm my ski grabbed and high sided me. As I barrel rolled I knew there would only be one chance to arrest the fall before I was going too fast but as I came round onto my feet I found my binding had released at the rear and I glanced off the snow and flipped again. I just had time to think that it would hurt a lot ragging over the sharks teeth when I landed on my feet. Assessing the damage I found the spike of my axe had shredded my ski pants down one thigh. Then I felt a bit of pain in my knee and inspecting through the gash in my pants I found a cut right on the soft tissue between femur and tibia, somehow my axe or the rock had glanced off rather than imbedding into the joint. Lucky. Liz and Dave hadn’t seen my flip and were some way below so it was time to get going and catch up (again). 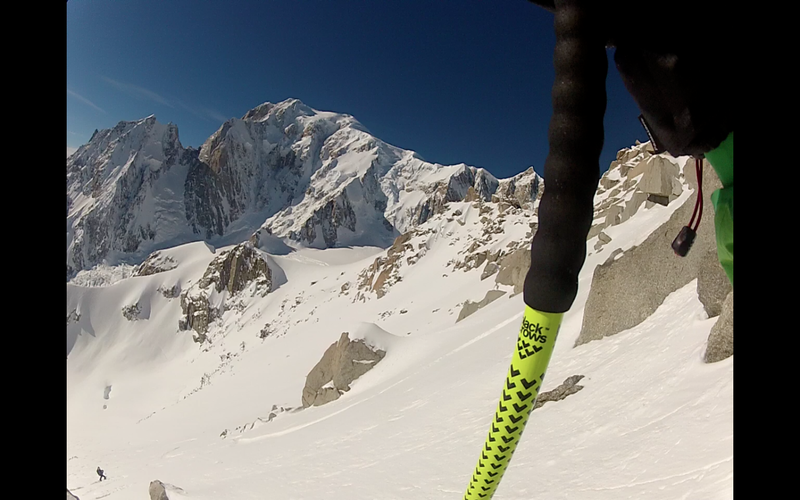 After about 100 m of sharks teeth the couloir opens up and the snow was perfect to let rip. (short video below). The final twist to the day was to find the the pocket on my pants had been shredded and with it the car key lost. Thanks to Michelle for coming to Italy with the spare key. Win! 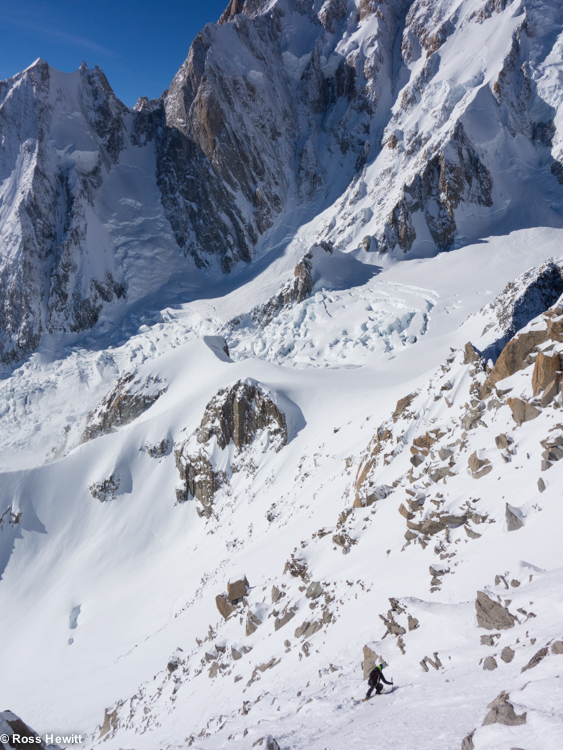 This entry was posted in Skiing and tagged Aiguille du Midi, alps ski conditions, Aosta, スキー, パウダースノー, フリーライド, beau, Berghaus, Black Crows, Brenva, canon, Chamonix, Chamonix conditions, Chamonix Mont Blanc, Col d'Entreves, commercial photographer, commercial photography, Courmayeur, 粉, Davide de Masi, вне трасс, катание на лыжах, порошок, Early season skiing, Entreves, EOS, EOS 5D Mark III, esquí, esquí de montaña, Europe, Extreme Skiing, 雪, Freeride, Freeride Skiing, Gebirge, Gnarly, Helbronner, Henry Christophe, High5, Hors Piste, image, Italy, j'envoie du gros, Liz Dailey, montañas, Montagne, Mountain Boot Company, Mountains, neige, neve, nieve, Offpiste, photo, photographer, photography, PLUM, polvere, rad, Ross Hewitt, Scarpa, ski conditions, ski mountaineering, ski randonnée, Ski touring, skiing in the alps, snow, snow conditions, sony rx100, Toula, Tour Ronde South West Couloir, Valley Blanche, Yak, 关闭滑雪道, 山, 山スキー, 山地, 滑雪 by Ross Hewitt - Skiing, Climbing, Photography. Bookmark the permalink. Sounds like an eventful day!